The Recession That Won't Quit. 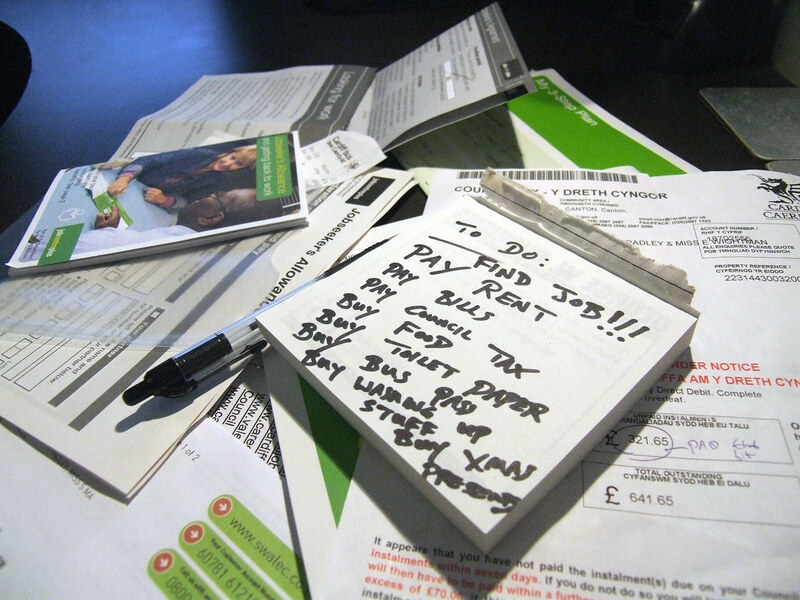 The Recession That Won’t Quit. Boy does the economy stink! The GDP report from the BEA was about as bad as it could get. I think the economy is rapidly approaching stall speed. The insanity in D.C. has already put an additional damper on the prospects for the future. The price index for gross domestic purchases increased 3.2 percent in the second quarter, following an increase of 4.0 percent in the first. Excluding food and energy, the price index for gross domestic purchases increased 2.6 percent in the second quarter, following an increase of 2.4 percent in the first. In the past six months core inflation has been rising at an annual rate GREATER than 2%. What does Ben Bernanke say about core inflation? When does the Fed get nervous about this measure of price change? Bernanke has said a half dozen times that he felt that core inflation“around 2%” would be the upper bounds the Fed would tolerate. Anything beyond the 2% level and easy monetary policy would no longer be justified. We do have to pay adequate attention to our dual mandate. It’s not clear we can get substantial improvement without inflation risk. Yes, it’s correct that Bernanke’s definition of inflation covers a longer period of time than six months, and yes, the last six months is not what he is focusing on. But it is also correct that neither he not his cohorts can ignore what is happening on the inflation front.We are already running a rate of core inflation that is hotter than Bernanke has promised to deliver. My conclusion is that monetary policy is on hold. The economy would have to be evidencing negative growth for the Fed to act. That is unlikely to happen before 2012. If you’re waiting for a QE3 miracle, you’ll be disappointed. With that definition in mind consider the (significantly) revised GDP results for the past few years. The revisions by the BEA yesterday make for some interesting conclusions. 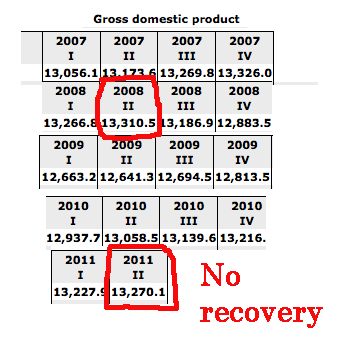 Consider the quarterly GDP numbers since 2007. Note that the peak in the most recent economic cycle occurred in the first quarter of 2008 when GDP was growing at an annual rate of 13.310 Trillion. As of the end of June there has been a recovery (13.270T), but we are still below the peak. ($61B shy). So if you’re out there feeling and seeing that the economy is a piece of crap; that it has been a piece of crap for nearly four years now. You’re right. 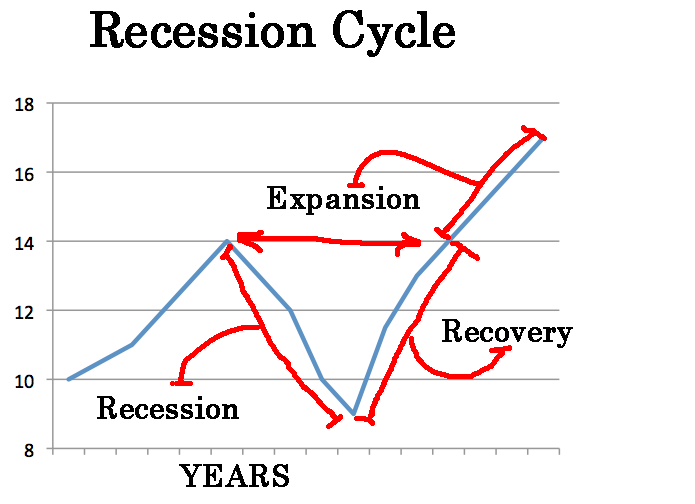 The media has been telling you that the recession cycle has ended and we are back to growth, well,they’re lying. Bruce Krasting: On More QE and the Recession that won’t end.